As you may or know, Quebec is having a renaissance. Cider has been drunk in the Belle Province since the 17th century but people have opened their eyes to it only recently. Most of the attention has been on ice ciders — a niche gastronomical product with the foodie in mind. However, cider producers are diversifying and going after a broader market appeal. Hugues Lavoie, co owner of Domaine Lavoie is one such person. Lavoie wants to grab the attention of the younger crowds. His family has been in the business of growing apples for 30 years and for the last 15 they have been making craft ciders. They are based in the city of Rougemont, the apple capital of Quebec. Besides cider, they also make wines. Last year, he introduced a cider based drink made with hops. First in a bottle and now in can, it has a sleek and dynamic look. With Hugues, Lavoie expects to draw in the hipsters as well as microbrew aficionados. The cider is made with Cortland apples from his orchard while the hops comes in from a secret supplier. 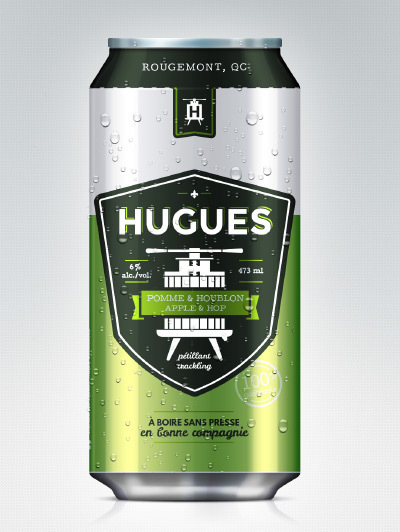 Hugues serves as the entry product — a first taste for their other ciders and wines. Hugues is a happy marriage between the cider and beer worlds. The white hops has a floral component that brings to mind mint, verbena leaf with notes of thai basil. On the other hand, the cider balances out the bitter taste of the hops. Quite refreshing, it drinks on its own or with bbq fare. Get it while you can.